OKW’s award-winning SYNERGY enclosures can now be wall mounted using a new concealed suspension element. This new suspension element is compatible with the circular R120 (ø 4.72”) and 140 (ø 5.51”) variants of SYNERGY. Its hidden fixings are even more discrete than SYNERGY’s existing wall suspension element (which can be installed with only one screw). The new wall suspension element’s adapter (1.77” x 2.28”) is attached to the housing using customized double-sided foil on a foam rubber carrier. This adapter fits into a housing which is either screwed to the wall or attached using adhesive foils (available as an accessory). A clever locking pin system provides removal protection. Each kit is supplied with an adapter, two adhesive foils, one holder and two locking pins. All the plastic components are molded from ASA+PC-FR for added strength and UV stability. The standard color is black (RAL 9005). These anodized aluminum enclosures are finished to a meticulous standard and are available in four shapes (square, rectangular, circular and oval) and 36 plan sizes ranging from ø 3.94” and 3.94” x 3.94” to 7.87” x 3.94”. Enclosures can be specified with or without battery compartments for 1.5V AA cells. All the fixings are concealed thanks to SYNERGY’s smart fast-connect construction system. Four internal assembly pillars hold each enclosure together. They snap into the recessed top panel, locate the assembly extrusion and are fixed to the bottom part with four stainless steel Torx T10 anti-tamper screws. Prices for SYNERGY start at $36 for the R120 model. 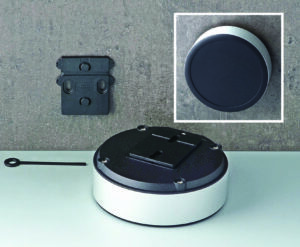 Accessories include the wall suspension elements (the new one costs $9) plus polarity reversal protection devices, battery clips, button cell holders, battery compartments, an extender kit for the PCB pillars, self-tapping screws (PZ1 0.098” x 0.236”) and a Torx T10 screwdriver. OKW can supply SYNERGY fully customized ready for the installation of PCBs. Services include CNC machining, lacquering, printing of legends and logos, RFI/EMI shielding, plastic and aluminum panels, membrane keypads, display windows and assembly. This entry was posted in Enclosures, Enclosures, Global, North America, On Ticker, top articles, UK. Bookmark the permalink.